King Kong is set to be a smash hit! Today’s media launch at Regent Theatre, Melbourne, unveiled not only a superb Australian cast but one of the most comprehensive international production collaborations Australian Musical Theatre has ever seen! This musical is brand new! There is no precedent in the Musical Theatre world to draw comparison to for this production. As such the production team have been exceptionally careful with selecting cast, crew and collaboratives. 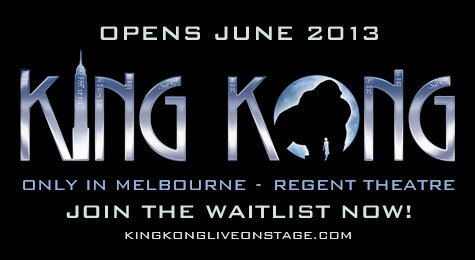 Five years in the making with three years spent casting, King Kong will premiere in Melbourne on 15 June 2013 for its exclusive Australian season with a never-before-seen production on the grandest of scales with exceptional performance skills from cast and creatives combined with state of the art animatronics engineered by Global Creatures. *Stay tuned to DANCELIFE for further interviews with Principal Cast members this coming week on our Blog! Produced by Global Creatures, makers of the global phenomena Walking With Dinosaurs – The Arena Spectacular (WWD) and How To Train Your Dragon Arena Spectacular (HTTYD, in association with DreamWorks Theatricals), KING KONG will be one of the most ambitious productions ever to be seen on the Australian stage. Based on one of the great modern myths, this world-first adaptation as a large-scale musical has been created by an award-winning international team comprising: director Daniel Kramer, a Southbank Award-winner and rising star of the European opera and theatre stages; Tony-nominated writer Craig Lucas; BAFTA winner and Grammy-nominated composer and arranger Marius de Vries; young New York-based lyricist Michael Mitnick; American Choreography Award-winner John O’Connell; the multiple Helpmann Award-winning production designer Peter England; creature designer Sonny Tilders, the mastermind behind the amazing animatronics in WWD and HTTYD; Tony Award-winning costume designer Roger Kirk; the Olivier Award-winning UK lighting designer Peter Mumford; Grammy, Tony and Olivier Award-nominated US sound designer Peter Hylenski; Berlin- based, Green Room Award-winning projection designer Frieder Weiss; international aerial and circus director Gavin Robins and puppetry director Peter Wilson, a Sidney Myer Performing Artist of the Year. Some of the world’s best contemporary artists, including Robert Del Naja from Massive Attack, Sarah McLachlan, Justice, Guy Garvey from Elbow and The Avalanches will be contributing new and existing songs to the musical landscape of the show, with Stephen Pavlovic from Modular People, the Sydney-based music label and promoter, a key collaborator. Featuring a cast of 49 actors, singers, dancers, circus performers and puppeteers; a crew of 76; and arguably the most technologically advanced puppet in the world – a one-tonne, six-metre tall giant silverback – KING KONG will be an epic and dazzlingly original theatrical experience. KING KONG tells of a Hollywood director, Carl Denham, who takes his crew on a perilous journey to the last uncharted place on earth, Skull Island, to capture a huge prehistoric creature, the last of his kind – Kong. The love affair between Denham’s star, Ann Darrow, and his first mate, Jack Driscoll, unfolds against the burgeoning horror of Kong’s ultimate escape and threatened destruction of Manhattan. KING KONG is one of the few modern tales to stand beside the ancient myths for its power to inspire wonder, fear and romance in equal measure. At the time of KING KONG’s original release in 1933, America was in the grip of the Depression. Yet in New York City, a place so deeply associated with the character of Kong, it was a period of incredible construction. Broadway became Broadway and those iconic landmarks – The Rockefeller Center, the Chrysler Building and the Empire State – all went up, making an indelible mark on the Manhattan skyline that continues to impress today. Conceived by its director Merian C. Cooper simply as a great entertainment, mixing horror, adventure, romance and fable, KING KONG became an instant hit on its release. Made on a comparatively big budget for the time, it was considered state-of-the-art for its technical innovations, including the combination of stop-motion animation with live action. To put it in perspective, the film was as cutting edge as Star Wars was in 1977 and Avatar in 2009. The story, which continues to fascinate almost eighty years later, grew out of the real-life adventures of Cooper himself, a larger-than-life entrepreneur with boundless energy and eclectic interests. With filmmaking partner, the cameraman Ernest B. Shoedsack, he made two landmark drama-documentaries set in the wilds of Iran and Thailand. Prior to this Cooper had been a crack pilot in the U.S. air force during World War I and later again during WWII when he was almost fifty years old. In a break from the film industry he had a stint as a New York City businessman where he became involved in the formation of Pan American Airways. He joined film studio RKO in 1931 during which time he put Fred Astaire together with Ginger Rogers, introduced Katherine Hepburn to Hollywood and collaborated with the legendary director John Ford. At this time he also met Willis O’Brien, the technical whiz who was to play such a large part in the success of KING KONG through his incredible special effects and animation work. And along the way Cooper contributed to the development of Technicolor and the widescreen format, Cinerama. It has been said that Cooper and the character of go-getter Carl Denham, the film director in KING KONG, are one and the same. Soon after KING KONG was released the franchise began its global spread, mostly at the B-grade end of the scale. The character has appeared directly or indirectly in film, from low budget sequels Son of Kong and King Kong Lives to the cheesy, but now cultish, Japanese knock-offs in the sixties, to the mainstream remakes by De Laurentiis in 1976 and Peter Jackson in 2005. Kong has spawned magazine serialisation, comic books, novelisations, animated television series, video games, theme park rides and numerous pop culture references. It has never, until now, been adapted as a musical for the stage. KING KONG is simply one of the great modern myths. Its appeal is universal and its story resilient enough to have different meanings to different ages at different times in our history. The idea to adapt KING KONG for the stage began five years ago when newly appointed CEO of Global Creatures, Carmen Pavlovic, considered how to next use the extraordinary capability of the company’s animatronics technology. Global Creatures was already having huge international touring success with the landmark Walking With Dinosaurs – The Arena Spectacular (WWD), which featured hyper-real animatronic creatures, so it made sense to look for another project that utilised this technology. The novel of the original screenplay, which was published as a promotional tool in 1932, a year before KING KONG’s release, became the principal source and Global Creatures secured the authorisation of the Merian C. Cooper Estate. It was agreed that the story was too iconic to mess with and so it required a writer who was comfortable with that, and would also be able to work collaboratively in a team and understand the physical constraints of the leading character. They approached Craig Lucas, the distinguished New York playwright and screenwriter whose credits include Prelude to a Kiss and The Light in the Piazza (both of which were nominated for Tony® Awards, with Prelude also winning the Obie Award for Best Play). Over the months that followed, the creative team was completed: the talented young New York-based lyricist Michael Mitnick; multi award-winning choreographic luminary John O’Connell, who was named Best Choreographer at the American Choreography Awards for his work on Moulin Rouge; the Tony® Award-winning costume designer Roger Kirk who has credits on Broadway and the West End as well as Australia; master puppeteer and puppetry director Peter Wilson and aerial/circus director Gavin Robins who have both contributed to several large-scale events including the Sydney 2000 Olympics and will collaborate to bring Kong himself to life; the Berlin-based projection designer Frieder Weiss, an expert in real-time computing and interactive systems; Peter Mumford, the UK lighting veteran who has worked across all the art forms over a forty-year career; and the brilliant U.S. sound designer Peter Hylenski who previously worked with Global Creatures on WWD and HTTYD and has been nominated for a Grammy, a Tony and an Olivier Award for Broadway musicals such as Shrek the Musical and Rock of Ages. Groups of 20 or more: A-Reserve $95 per ticket Tuesday to Thursday evenings inclusive; and A-Reserve $80 per ticket Wednesday matinees. School Groups of 20 or more, with children aged 18 or below, can attend a Wednesday matinee for $55 per ticket (max 2 supervising adults at discounted price). Group and School Group allocation is subject to availability and conditions of sale apply. A handling fee applies to all purchases. Delivery fees apply to non-outlet purchases. Processing fees apply to non-cash purchases. Performance schedule is subject to change. Please check times around public holiday and school holiday periods. Prices, policies and cast are subject to change without notice.